In about 1950, Walter James ‘Jim’ Harvey (b. 1922) met Paul Bigsby, the innovative luthier and musician, ata gig in California. The appearance of the instruments that Harvey later designed show Bigsby’s influence. See link below for more information. 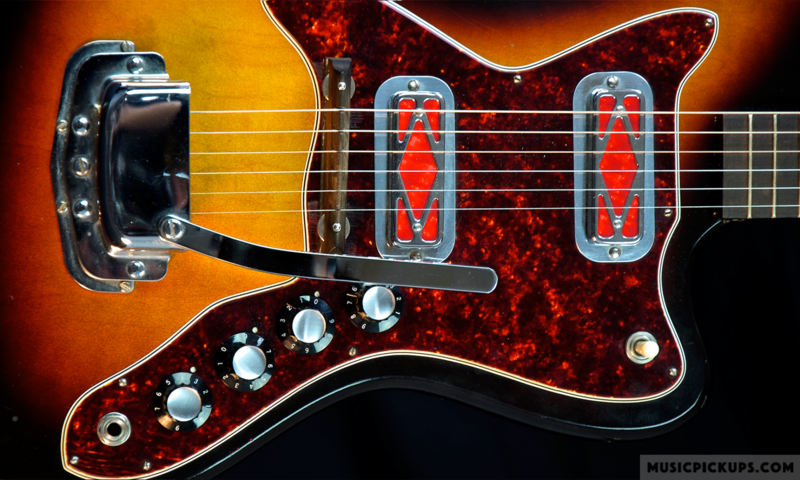 (Jim Harvey should not be confused with Harvey Thomas, the Washington luthier, famous for his ‘Iron Cross’ guitars with mostly Schaller pickups). Some of Harvey’s guitars used a four-string version of the DeArmond Model 210 pickup ( standard Model 210 shown above) was also used in the double-necked instrument currently on display in the Museum of Making Music in Carlsbad, CA 92008. The two outer poles were removed and the holes sealed off. This instrument is shown in the featured image for this page (Photo copyright Museum of Making Music, Carlsbad, CA 92008). See also the entry for the luthier F. A. Thorp on this site.